What I like: Exploration, city management, research, diplomacy and magic add up to a very satisfying package. Very replayable. Not So Much: Tactical AI could be better; city improvements could be more varied. I want to see how many turns it takes my unit to reach its destination! Other stuff you may like: Seems to have good modding support, but you’ll need to do some research to find out. Disclaimer: This review is based on a free review copy provided by Stardock Entertainment. Elemental: Fallen Enchantress (FE) is the new turn-based 4x fantasy strategy game by Stardock Entertainment. From the sound of it I am fortunate to have skipped its predecessor Elemental: War of Magic, released in 2010. 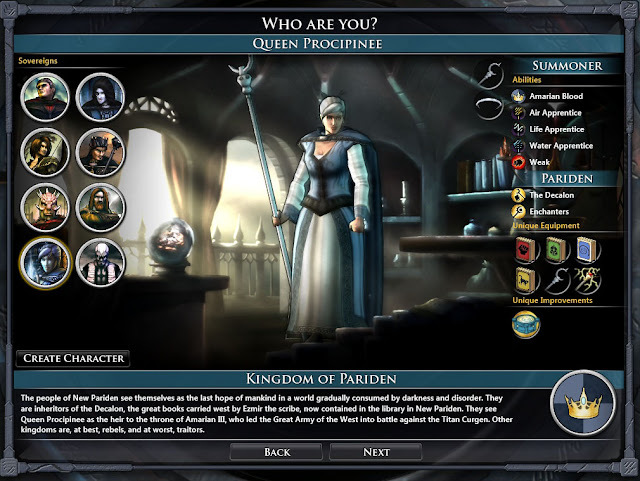 I feel compelled to mention that Stardock is offering Fallen Enchantress for free to anyone who purchased War of Magic before a particular date due to the original’s inadequacies. While it would have been preferable to release a high quality game, this level of customer support is almost unheard of when a company releases a flop and I applaud the step Stardock has taken to right a wrong. Fallen Enchantress has often been compared to Master of Magic and Age of Wonders. Luckily my memory is so bad that even though I played those games a long time ago I can’t remember them well enough to make such comparisons. 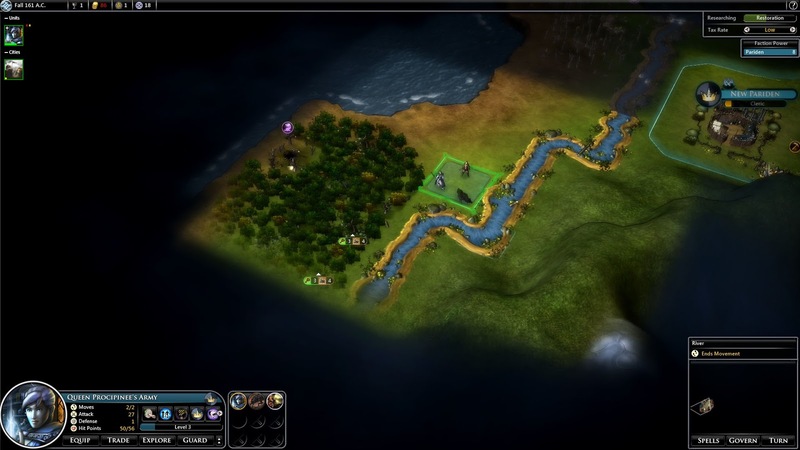 Instead I’ll compare it to Civilization IV! Well, even though it shares some similarities with my favorite 4X game let’s see how FE stands on its own. Fallen Enchantress is set in a land of magic and monsters after a cataclysm has wiped out much of its populace. As each faction tries to rebuild to reunite or crush its fellow inhabitants, the wild creatures that have proliferated after the cataclysm will be a major obstacle. Whether you focus on demonstrating your power through magic or more traditional might is up to you and the strength of the faction you play. FE is purely a single-player experience without any form of multiplayer game. Since I am a hermit in a cave, I am fine with this limitation but those looking for a game against human opponents will have to look elsewhere. Sometimes jumping into a new 4x game can be a tad intimidating since there tends to be many choices to make. My approach was to play the tutorial and then start a game on normal difficulty. The game also provides popup tutorial messages when you encounter a new game element, provided you turn the option on. Why they weren’t on by default I’m not sure, but they are helpful for your first game. The tooltips during the game are usually helpful communicating some of the details. Even though I made many bad choices during my first game, I was able to win a conquest victory without too much trouble. The manual is worth a read but I had to fill in a couple details by visiting the forum. I did find some features that were not covered at all, such as economic treaties. The sandbox game, initiated by selecting ‘New Game’ from the main menu provides the primary way to play FE. 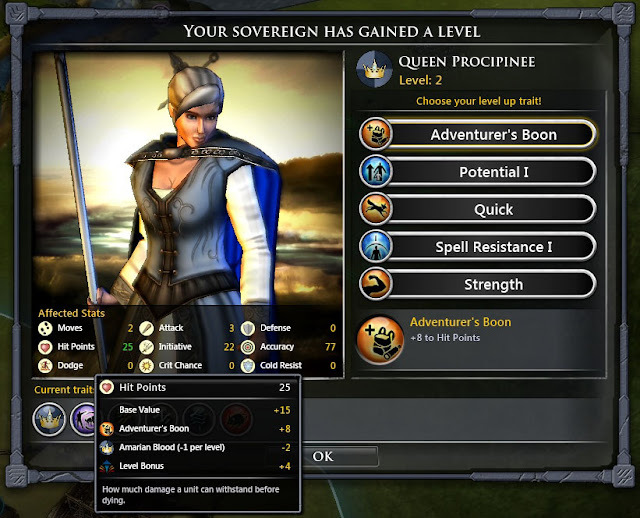 The player can select 1 of 8 sovereigns to play or create a custom sovereign. There is plenty of variety between the sovereigns and provide different play experiences. In my opinion there is a much greater difference between sovereigns than there are between civilizations in Civilization. Custom sovereigns grant an enormous amount of customization. There are a wide variety of skills and abilities to groom your sovereign as you see fit – definitely a strong point of the game. Below is Queen Procipinee, a sovereign heavily favoring magic. She belongs to the Pariden faction which provides the Decalon and Enchanters faction traits. The Paridens belong to the Amarian race which provides the Amarian Blood trait. Her profession is a summoner, granting improved summoning ability. Sovereigns can also have magical abilities, talents and equipment assigned further defining how they play. Tooltips explain the effects of all these traits. Once you delve into the character creation tool it becomes a little less confusing where all these traits come from. The player can also tailor the game by modifying many game settings: using a randomly generated map vs. 1 of the 6 designed maps, frequency of resources and monsters, research speed and more. FE also ships with a scenario, telling the story of how the cataclysm came about. The back story is interesting enough, but I have to say I wish I could get hours of my life back by not completing this scenario. The focus of the scenario is on storytelling, which has your champion running around performing quests – kill this, get that, etc… City improvement and research take a huge back seat to the tactical battles. While I do enjoy the tactical battles in the sandbox game, the ones in the scenario were generally so easy and frequent that they were boring. I recommend trying the scenario for an hour or two, but if you find yourself bored do yourself a favor and stop. Don’t be a martyr. 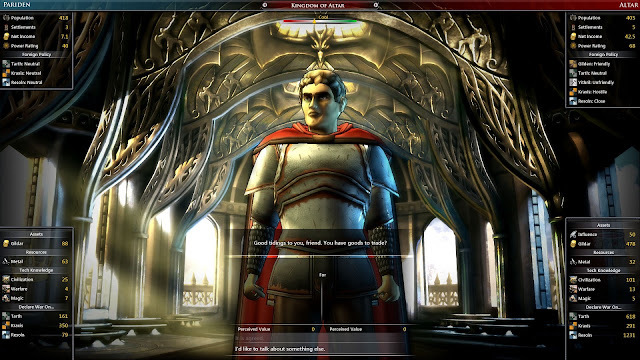 The sandbox game has 4 paths to victory: conquest – eliminate everyone else, diplomatic – have alliances with all remaining players, Master Quest – complete the special epic quest hidden on the map, and Spell of Making – research a technology that unlocks 4 special city improvements which when built allow the player to cast a spell and win the game. So far, I have been able to achieve conquest, spell of making, and diplomatic victories. The spell of making victory seems too easy to get and I may consider disabling it in the future. At the start of the game you have your single sovereign, the leader of your faction. 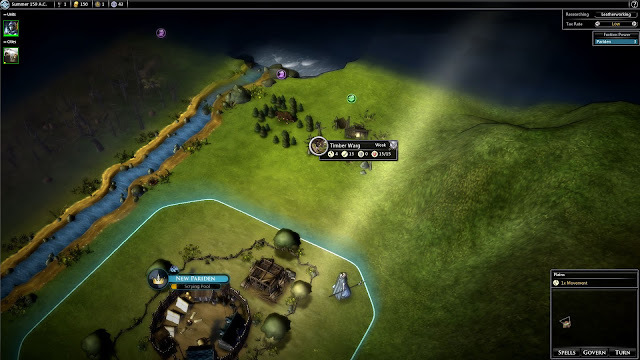 The first choice in leading your faction to greatness is deciding where to place your initial city. Cities can only be placed on tiles that yield the standard resources – marked with the tile yield display on the map. I display them all of the time since they help plan where to expand next, but they can be set to only display when settling a new city if you prefer a less cluttered look. The 3 standard resources provided by a city tile are grain - which is a major factor for how large a population the city can support, materials - which define how fast the city can produce improvements and units, and essence - which determines how many city buffing enchantments can be cast on it along with the effectiveness of some city improvements. These tile yields are not the only consideration for city placement. Cities on a river can build the pier improvement, which helps support a larger population and economy while bordering a forest allows the lumber camp which boosts production. In addition there are special resources dotting the landscape that can improve the city they are attached to and provide the resources needed to build equipment for your troops. As you can see from the city details screen below, a city produces 5 different types of outputs. 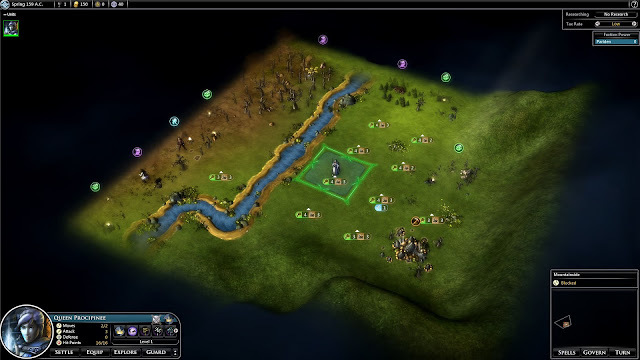 These outputs are heavily influenced by the resources on the city tile, but are affected by city improvements, spells, technologies, and special resources located outside the city that can be developed – such as a grain field or clay pit. The benefit to this approach as opposed to the Civilization method (using workers to improve the land) is that the end game doesn’t bog down when there are a number of cities to manage. Since there are not multiple ways to improve a specific terrain tile, the player doesn’t have as much flexibility to alter how the land is worked. Unfortunately most of the improvements aren’t very interesting – they are simple economic buffs. City development choices tend to be to decide what area of production to improve next. There are a handful of city improvements and buff spells that require a tradeoff of some sort which makes the choice a bit more interesting. Some of the military improvements found in specialized fortress cities have a bit more diversity. There are only a handful of ‘wonder’ improvements – improvements granted to only the first faction to build it. These are one of my favorite parts of games like Civilization and they are lacking in FE. There are very few unique faction improvements which could add a bit more flavor to city development. It may seem I’m being fairly negative about this aspect of the game, but it isn’t bad. The player has to prioritize how each city will be improved to meet their empire’s needs. It just could have been raised from good to great. Gildar (money) is used to pay for troop maintenance, recruit champions, buy equipment and can be used in trade. Research determines how fast new technologies are known. Mana is the currency of spell casting, both as a cost when a spell is cast and maintenance for city and unit buffs. Food determines the maximum population of the city and production how fast improvements and units are produced. Balancing the generation of these resources to support your strategy is an important aspect to FE. The growth rate determines how fast people are flocking to your city. Unrest is a form of waste which leeches production and research away from your city. Both of these items can also be managed using improvements and spells. One of the primary tasks for any sovereign is managing each city’s economy to support their immediate goals - such as researching a spell useful for clearing out some monsters blocking expansion, and the long term goal of pursuing a victory condition. When the population reaches a particular amount, the city gets to level up and become a town, fortress or conclave. Each specializes in a different area. Towns improve the economy the most. Fortresses produce better units, have quicker unit production and are easier to defend. Conclaves boost the research provided by the city. Subsequent level ups provide a choice of special upgrades related to the type of city specialization. These are permanent choices so the player needs to decide what is best for their faction long term. I love these types of choices to shape my experience. The tax rate is another tool a ruler has to manage their economy. A higher tax rate brings in more money, but at the cost of higher unrest. A city’s unrest reduces its production and research, but if you quickly need some coin it may be the only option. In general I almost always find it beneficial to keep the tax rate low because it has the biggest overall benefit. It only makes sense to increase the tax rate when you are willing to sacrifice overall production and research to generate some money needed to rush production in a particular city or for use in a trade agreement. All of these aspects to city management combine into a satisfying, but unspectacular package. In addition to money, research, and mana there are some more important resources to collect. Prestige makes your faction more attractive to the people living out in the uncivilized world (these are abstracted and not visible anywhere). Prestige can be gained by researching various technologies, building world improvements (think wonder from Civ) and developing prestigious locations on the map. Prestige increases the growth rate of your cities and has an effect on diplomatic relations. Crystal is mainly used to produce magical equipment and is mined from crystal deposits. Metal is used to create the more mundane equipment for your troops and is mined from iron deposits. Horses and wargs can be gathered to provide mounts for your troops. When designing troops, any can be put on a mount to give the associated benefits. All of these resources are stockpiled, meaning each turn you have one of these resource locations developed within your borders, the resource is collected and added to your pool. When you use the resource it is subtracted from your pool. This is a more natural mechanic then the way Civ handles strategic resources. I think a potential improvement to this mechanic would be to add a scavenger trait which allows the winning side of a battle to scavenge a portion of the materials from units lost in combat after the battle. Shards are locations on the map that can be developed to provide mana and boost the power of certain spells. For example, some spells may provide extra damage if you have shards from the corresponding school – a fire shard can increase the power of some fire magic spells. These shards provide incentive to get out and explore to claim them before other factions do. This is a nice touch and I don’t recall a similar feature in other 4x games. So your cities are producing research, what does it get you? Research is split into 3 different paths: civilization, warfare, and magic. 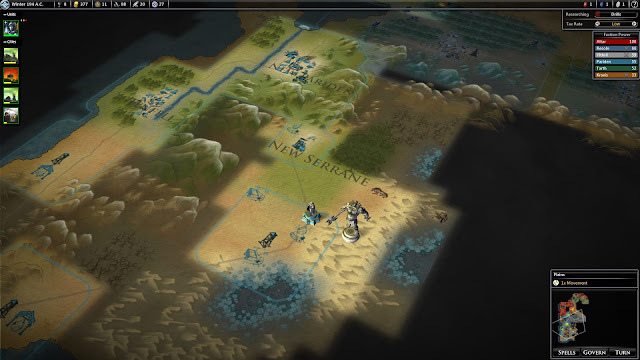 Basically the civilization path improves the economy, warfare improves your ability to wage war by unlocking different equipment and boosting army size, and magic unlocks spells, magical equipment, and other aspects related to the arcane. With 3 separate paths research can proceed down one while neglecting another. This is an improvement over the 1 tech tree approach as it allows the player to specialize more. In other games you can only proceed so far down one path before hitting a requirements roadblock. In reality, neglecting the civilization path long term will cause your faction to fall behind but increased flexibility is certainly there. Unless you start with another faction in your lap, starting with the civilization path seems like it would always be the correct choice. The decision is at what point research should cut away from this path. Some spells are unlocked via research, while others are only available to those skilled in a particular school of magic. There are 6 schools of magic, each with 5 levels. Sovereigns and champions can improve their spell abilities if the perk is offered when they level up, unlocking more powerful magic. It is nice to have some magic available to all while other magic requires specialization in that field. Everyone gets to play with some magic. I’m also impressed with the variety of spells – unit buffs, city buffs, healing, damage in tactical combat and more. One spell can give a champion a level boost at the cost of some of your sovereign’s hit points. One faction has a spell that sacrifices a unit to gain some mana while another can use magic to bring an enemy city under their control. Magic is a powerful force in FE. The early game is all about exploration and collecting loot from loot drops on the map. Loot drops are marked with a green chest if that option is turned on. At the start of the game your sovereign is the only unit you have. They can handle some of the easier encounters on their own, but will eventually need some help. Only sovereigns and champions can collect the loot drops. These can provide a variety of rewards – books that grant experience, weapons and armor, money, and more. In addition to loot drops, many monster lairs dot the landscape. All monster lairs use the purple dragon icon. Lairs periodically produce units that can wander around their area and attack your troops and cities. In fact, if your borders grow to encompass a lair, the lair is destroyed and the monster will start to roam. If the creature is powerful, you may want to take care not to release it in this way. One of the factions actually has a trait so monsters don’t attack them. It makes exploring significantly less dangerous. These monsters provide much of the combat opportunities in the game and can be quite deadly. They feel similar to the wondering monsters in Warlock: Master of the Arcane and Conquest of Elysium 3. These creatures are not just thrown in to let the player get some early experience points and provide a mild distraction like the barbarians in Civilization, although early encounters tend to be easier. They must be actively managed like a serious enemy. I don’t fully understand how they decide when they will roam and what they decide to attack though. It seems rather hit or miss. Procipanee eyes the loot drop and timber warg to the north. All units level up when they acquire enough experience, usually through combat but also gained through other means such as books or quests. 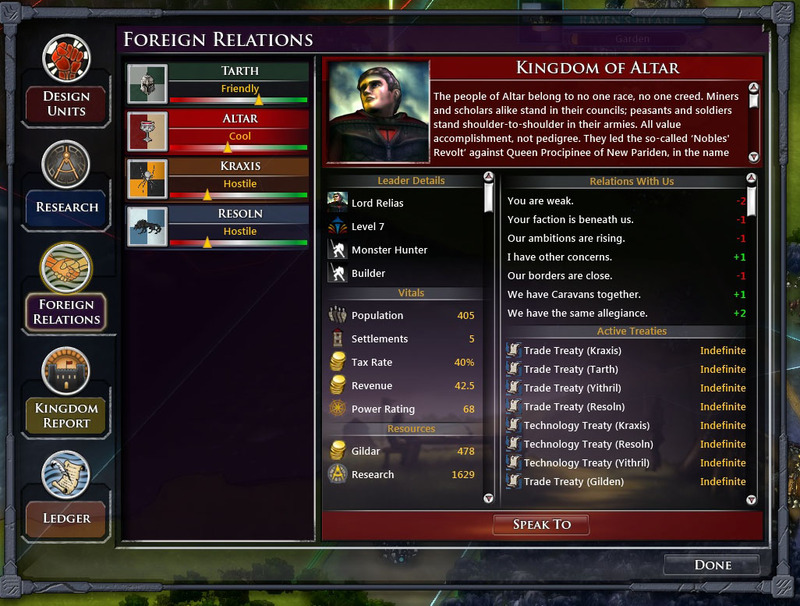 Trained units (built in cities) get stat bonuses, but sovereigns and champions also get to select a trait. These traits give the player a mechanism to tailor their champions’ strengths. At level 4 the sovereign or champion can be specialized into 1 of 5 fields, emphasizing different aspects of combat, magic, or city governorship. Hey, you got your RPG in my strategy game. Sovereign and champion leveling up are another strong point to the game. See how Procipinee’s hit points have gone up due to a level bonus. She also gets a choice of 5 traits. 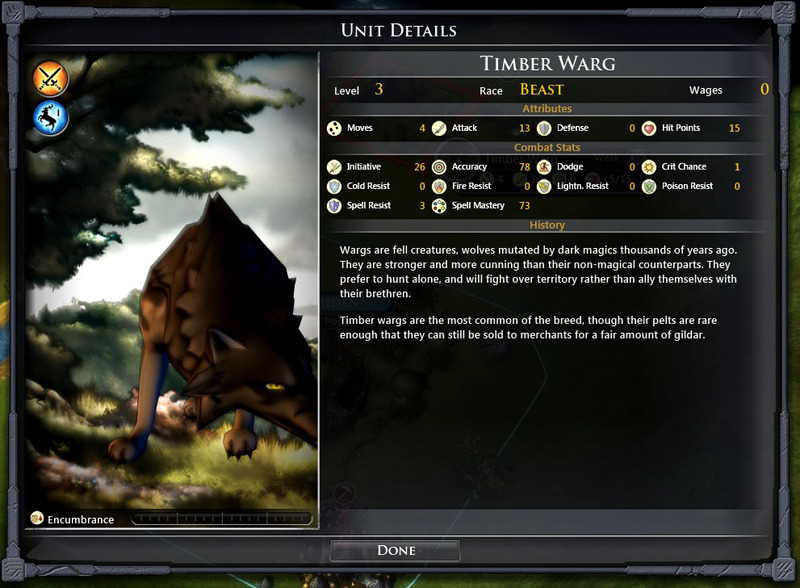 Since we are getting ready to take on the Timber Warg it is time to look at how units are modeled. The Timber Warg is just 1 of over 100 types of monsters roaming the land. Some of these are just variations of each other so it may not be as diverse as it seems, but the unit stats and abilities make fighting them interesting and varied. Take note that some people have been complaining that they wished for a more fantastical assortment as there are many based on more mundane creatures – bears, wolves, spiders, etc… Also the factions are essentially humanoid based with human based-units so those looking for bit more diversification may be disappointed. Most of the differences between the factions come from the faction traits themselves, not the individual units. Some factions can equip their units with variations of the standard equipment, making them improved in a particular area. The unit stats and abilities are fairly detailed for this type of game. There are 3 physical attack types (bash, pierce, and cut). Some armor is better at protecting against certain attack types and various creatures resist particular kinds of damage too. You want match ups that favor your troops. Bash attacks can have a chance to knock someone down, unless of course they are so large or strong to have a perk that negates this effect. A pierce attack is good at penetrating armor. Cutting weapons tend to give the bearer a chance to counter attack when they are the target of an attack. Missed on your first swing with that axe? Don’t worry, you may catch them with the backswing. The cool thing is that technologies unlock equipment and you can design your own troops using a mix and match of things. Once of my favorite aspects of the unit model is the initiative system. High initiative units attack first and attack more frequently. In many games initiative seems to only define the order units get to take action, but they each get one attack per turn. In FE, that lumbering ogre may be powerful but your faster units may get to take almost 2 actions to his one. A creature’s chance to hit is their accuracy minus the target’s dodge. The creatures could use more variety in this area. While playing I noticed that creatures tend to hit more often than not and a quick perusal of the in-game help revealed why. It seems most creatures’ accuracy is in the 75-90% range, with more powerful creatures having a greater accuracy. Having some low accuracy / high damage creatures would have added a nice change of pace and some tension to their attacks. Spells have an equivalent mechanic – a resistible spell’s chance to hit is the attacker’s spell mastery minus the target’s spell resistance. On top of that some creatures are better at reducing the elemental damage caused by spells and some weapons. That fire elemental probably won’t be afraid when he sees your sorcerer cast a fireball spell. In addition to these stats a unit may have special abilities. One of my favorites is the maul ability possessed by a variety of creatures, such as the bear. A creature that can maul gets additional attacks as long as the prior attack hits. This can chain quite a few hits in a row on one attack. Each successive attack gets a reduced chance to hit. These abilities help give creatures their own personality. The timber warg has the counter attack ability and will respond to the first attack on him in kind between each one of his turns. Combat can be resolved manually in tactical combat or the player can let the game autoresolve it. If you have overwhelming odds in your favor it is pretty safe to autoresolve the combat, but the player can make much better use of his unit’s special abilities than the AI can. I have autoresolved some battles and wondered why my troops took so much damage, even if none died. The icons along the left side depict the combat order. During their turn a unit can move and take an action such as attack, cast a spell or use an item. If they pass on their action they get a defense boost. The tactical battles are simpler than I would like. There aren’t any flanking bonuses or terrain effects during the battles. The battles simply involve managing your unit’s movement and ability usage. Units do exert zone of control around their position so there is some strategy regarding unit movement. Adding terrain effects would make the battles more interesting – either an effect based on the strategic map tile type or better yet, the individual tiles on the tactical map. Because the battles are pretty basic, I’m a little surprised at how much I enjoy them after getting so sick of the battles in the scenario. The AI seems adequate in the tactical battles. The AI is good at managing the troops’ movement, keeping them out of harm’s way until they are ready to strike themselves. On the downside, it doesn’t always select the best target for its spells and abilities. For example, spiders have cast their web on mages and ranged units who probably weren’t going to move anyway. Why not take out a melee fighter? AI melee fighters cast berserk when they are several turns away from entering combat; raising their attack before it is necessary and taking 1 point of damage per turn for it. In another battle the AI blinded one of my champions and then slowed him. It would have been more effective to slow the other champion who had a much greater chance to hit them. My sovereign summoned a shadow warg to aid her in battle. A sovereign doesn’t permanently die in combat, but needs to recover before up to fighting strength. If a champion dies in combat they receive a wound which reduces their attributes in some way. Sometimes the penalty is pretty minor. Regular units trained in cities suffer permanent death. Sometimes death seems a little too forgiving for champions. Champions are units that behave similarly to sovereigns. They can collect loot, use equipment, gain abilities when they level up, etc… They do cost money to recruit. Champions are allied to either the Kingdom or the Empire so a faction can only hire those who share the same loyalty, unless your faction processes the betrayer ability which allows champions to be hired regardless of loyalties. Game play changes like this keep the factions interesting. Nothing says you can’t kill the champions you find in the wild who are not loyal to your cause. If you can’t have them nobody can! Fatal Attraction? Champions can make use of equipment, but the weight capacity must be managed. A champion that equips too much weight becomes encumbered. This reduces his initiative so the less frequent attacks must be balanced with the benefits of the equipment. The strength perk sometimes available when leveling up can increase the amount of weight a champion can equip without encumbrance. Procipanee gave some armor to her champion, which slowed down his initiative. After exploring the surrounding terrain, a suitable location for a second city should be discovered. In one game I was quite isolated and it took some time while in some cases I found one rather quickly. Founding new cities is handled by the pioneer unit. It should also be noted that resource deposits can be found in areas where it isn’t suitable to build a city. This is where outposts come in – structures used to bring resources into your borders so they can be exploited. These can also be targets of opportunity if you don’t protect them. I have had the AI destroy my resource harvesting improvements when they were not protected. Outposts have their own upgrades to improve the combat effectiveness of friendly troops protecting them in addition to other benefits. With its high materials this new location may be a nice spot for a Fortress so it can pump out units if need be. At some point along the way your champions will find quests to fulfill. These are optional affairs that involve traveling to some location to kill a creature for a reward. I haven’t encountered any that were particularly interesting, but are just another way to get some loot and experience. The Wildlands is a special area of the map that contains tough creatures and vast treasure. They are also supposed to contain some of the best city locations on the map. I’ve managed to conquer 1. In my other games I never really needed to explore them to achieve victory. Chances are you’ll eventually find another faction and you’ll need to decide if you want to befriend them or steal their lunch money. Unfortunately the diplomatic model is the most poorly documented area of the game. On one hand the relationship model is pretty transparent; the foreign relations tab of the ledger displays all of the factors affecting their opinion of you. This is good. I really dislike it when games hide the factors driving the AI’s opinion of you. Unfortunately the possible factors are not listed anywhere, but at least some of them are self explanatory. The numbers associated with a factor aren’t static either. Originally ‘You are weak’ was a -1, but now it decreased to -2. Looks like I’ll have to divert some of my production to military assets. I usually delay this as long as possible to build up the economy as much as I can. It is easy to see how your faction compares to another faction. When speaking with them it is easy to compare many of your faction’s vitals to theirs. There are a variety of treaties to enter too. There are non aggression pacts, two varieties of economic treaties and technology treaties, and alliances if their faction likes you enough. For most of these options the effect is clearly displayed during negotiations. The economic treaty isn’t mentioned anywhere, but some helpful forum members explained the effects to me. Usually I have to sweeten the deal to get the other side to make such agreements with me. I don’t think I have ever concentrated on generating much influence. When another faction is against the ropes, they sometimes spam you with requests for peace. There should be a limit to the frequency they can make such requests. It is FE’s version of ‘Are we there yet’? In general the user interface supplies all of the necessary information one needs to manage their empire and locate their various assets. 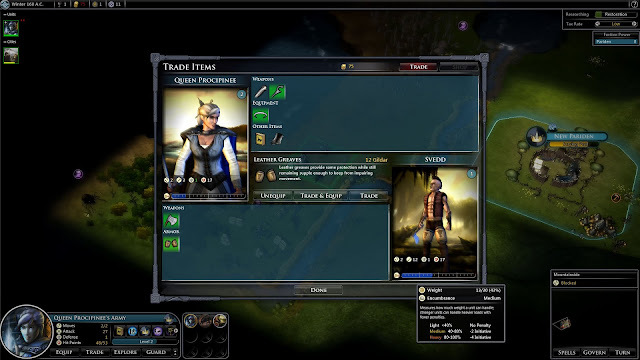 A ledger exists to get an at a glance look at your kingdom’s economy and various enchantments in affect – allowing the player to dispel unneeded enchantments or jump to a city. Toolstips abound to provide details of most elements. Units and cities are easy to navigate to using the list of icons on the left side. When the player zooms out, the strategic map changes into a ‘cloth style’ map giving a better overview of the entire area or world. The entire game can be played from this view as all important information is communicated here. 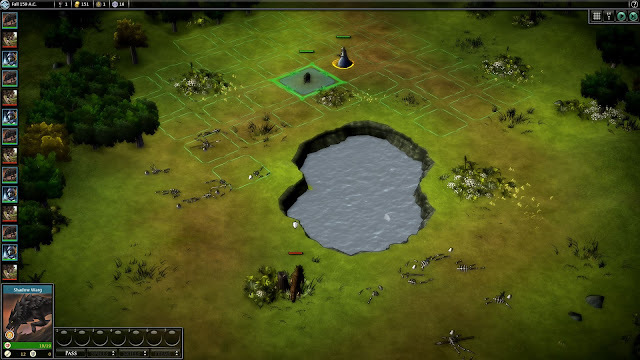 Cities, outposts, resources, monster lairs and units are all displayed. On the regular strategic map I sometimes had trouble picking out monsters and enemy units from the terrain. When I zoom out to the cloth map, units are more clearly displayed in a miniature board game style. There are some aspects of the UI that lack polish or exhibit odd behavior. One of my biggest gripes is that when ordering your units on a multi-turn trip, the number of turns needed to reach the destination isn’t displayed. I can’t believe such a basic feature is missing. The escape key doesn’t open up the option menu. I can’t remember playing a game lately where this didn’t occur. An indication is displayed on the left side of the screen when a city is idle, but I find myself not noticing it right away sometimes. 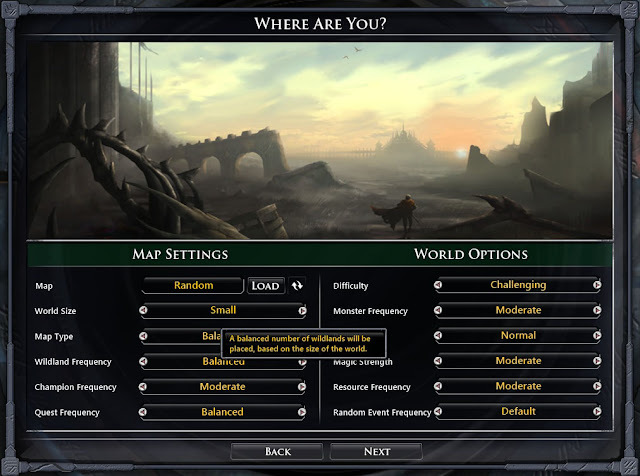 An audible cue would be appreciated to draw more attention to it, or have an option to get a popup message when a turn is ending with an idle city. It would need to be an option since sometimes cities are left idle intentionally. The best case would be to have a global option for a popup message that can be set to ignore in individual cities. The hiergameon is an online manual of sorts that has information about the different elements of the game, but falls short in several areas. 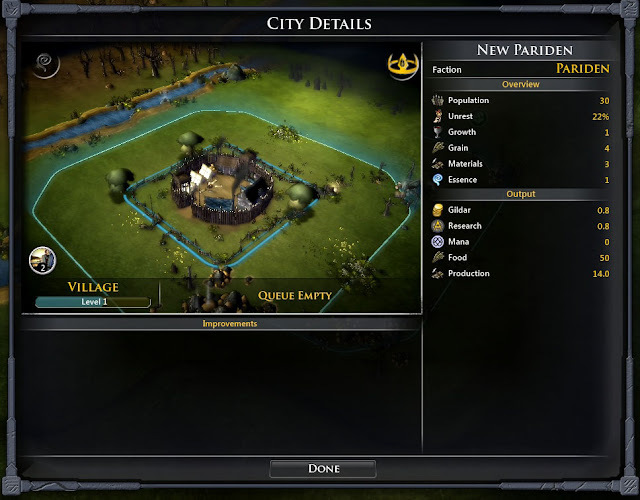 The details about city improvements are only displayed in a tooltip instead of the item’s description which leads to unnecessary hovering and waiting. To avoid confusion it would be nice if spells and other items only available to a particular faction were marked as such. Some of the fonts at 1920x1080 can be a little small. Luckily the text is clearly rendered and the size was never an obstacle for me, but I can see people with less than perfect eyesight having a bit of trouble. Some abilities or spells have a cool down period, but there doesn’t seem to be a way to see that for your enemies in battle. It would be nice to know how frequently that earth elemental can hurl a bolder at my guys. According to the tech tree the Destiny’s Guard unit should unlock with Leatherworking, but Training is also needed due to its shield. This caused me to waste a significant period of time while I tried to figure out why I couldn’t train the unit. There are other units that have the same problem. A couple times during the course of one of my games the unit path finding on the map didn’t work correctly. I had a clear path to an enemy unit and ordered one of mine to move next to it. It high tailed it in the opposite direction – appearing to take an alternate route. When I ordered it to attack the enemy unit it moved as expected. A combat log exists detailing the different exchanges in battle, but it would be nice if it provided more detailed information, such as the % chance to hit (accuracy and dodge), attack, defense, and spell mastery, etc… of each exchange. This would allow a player to more easily see why their troops performed how they did. The player is presented with a ranking and score at the end of the game, but there doesn’t seem to be any hall of fame or high score list. These types of games usually have such a feature to mark your accomplishments (time sinks) for posterity. There are 9 levels of difficulty. The one above normal (called challenging) uses the best AI algorithms while the AI doesn’t receive any bonuses to give it a boost. I easily won my first game at normal and won all of my others at challenging without too much of a problem. When I focused on building up my economy, the AI did try to take advantage of my weakness. I did find that there was more of a challenge on larger maps. My first games were on a small map, where I could concentrate my power into one army. On a medium map I was forced to have two strong armies to cover multiple fronts. I think you can see the pattern here – larger map requires less reliance on your sovereign. As I mentioned earlier, the AI has trouble targeting its spells at the best unit to get the most beneficial effect and sometimes uses abilities in non-optimal situations. I’m hoping that Mr. Wardell will continue to work in this area as he has a reputation as a strong AI developer. With the plethora of difficulty settings players should be able to select one that provides a challenge, but experienced strategy gamers will probably need to play one where the AI does get some bonuses to make it more competitive. In general, this is true for almost any strategy game so this shouldn’t be too surprising. Fallen Enchantress ships with modding tools. I’m not a modder and didn’t really take more than a cursory glance at them. The tools appeared to provide the means to create custom maps, along with the ability to create some new building blocks for those maps. It seemed like it should be intuitive, but at first I couldn’t even place a creature location from the palette onto my custom map. After restarting Fallen Enchantress I was able to. I’m not sure if it was user error or instability of the modding tools. That being said, there seems to be a lot of support for modding on the forums. A good place to start would be here. Much or all of the data is in xml files, so it appears users can create new creatures and other aspects of the game. I can’t say I was either amazed or appalled with the visual appearance of FE. The strategic map has areas of lush greens and drab browns, with terrain features clearly marked. The creature unit models were detailed enough and some had quite a bit of character. Text was crisp and clear, although bordering on slightly small at times. The city graphics as viewed on the strategic map tended to look a bit like a mess until the view was zoomed in fairly close. My biggest issue was that I sometimes had trouble picking out wandering units on the strategic map. They could use one of the hud icons like other elements. Other than that, none of the visual elements hampered my enjoyment of the game. To be honest I tend to block out the music in games. There are times I notice stand out tunes that get embedded in my brain and I hear them in my sleep, but for the most part they fade into the ether unless they are too loud or obnoxious. FE’s music is somewhere out in the ether for me which is ok by me. I don’t expect to be enthralled with game music. To be honest, I don’t even know if there is in-game music outside of the menu. I know it isn’t there all the time. The game performed almost flawlessly without any crashes or hiccups. I did have 1 crash while loading a saved game, but after restarting FE the save loaded without error. I had been tabbing in and out of the game extensively, along with exiting my game to the main menu and starting a new one. Performance was smooth zooming in and out of the strategic map. Late game turn times on a medium map were about 5 seconds. My Specs: Windows 7 64-bit. Intel Core i7 860 @ 2.80 GHz. 8 Gig RAM. ATI Radeon HD 5850. Fantasy 4x strategy gamers have had a pretty good year between Warlock: Master of the Arcane and now Fallen Enchantress. I prefer the deeper experience of Fallen Enchantress, but I hear Warlock has received a number of updates improving the game play. For Fallen Enchantress exploration, city management, research, magic, foreign relations and tactical battles all add up to a satisfying package. Please, please don’t play the scenario before trying the sandbox game as you may get turned off by it. The ultimately boring scenario focused on easy, repetitive tactical battles instead of the entire feature set of the game. Huge amounts of customization are available when creating your own sovereigns and factions. Unit customization isn’t nearly as interesting, but still worthwhile with the inclusion of traits in addition to equipment. I’m generally not a big fan of custom unit design, but FE does a good job. City improvements tend to be bland economic buffs, but city specialization and leveling up make up for it. The game could use more faction-specific buildings and ‘wonders’. There are a good variety of resources to manage, each with their own use. Having 3 separate research trees adds some flexibility to the player’s strategy. Magic is powerful and varied. Discovering shard locations and securing them for your benefit to boost your magical power is a nice touch. While the tactical combat could be made more interesting with terrain effects and flanking, the detailed unit model with stats, traits, and equipment adds enough variety to combat to keep it interesting. I love the initiative system instead of the ‘I move all my units, now you move your approach’. Fast units get more frequent turns! RPG aspect of your sovereign and champions are fun to manage as they level up. The tactical AI needs a bit of tweaking so it uses spells and abilities more intelligently. With some improvements I can see this franchise becoming an ‘A’ level game. As it stands I can easily recommend it for any 4x strategy fan, especially those with a fantasy bent. Fallen Enchantress tempted my to ditch the scores altogether as I waffled between an A- and B+. Grading something with so many subjective factors is too arbitrary. Just buy it.